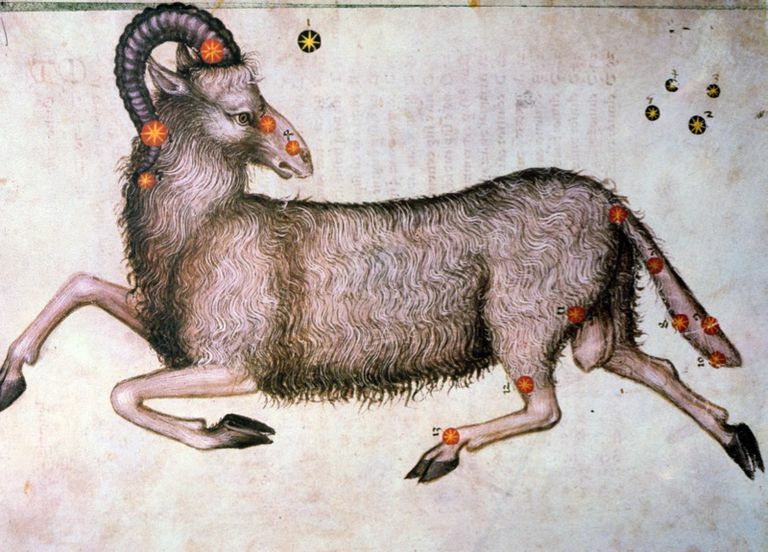 Aries or Ram (from Atlas Celeste De Strabov) Credit: SuperStock / Getty Images. Aries is Spring's own darling, who meets life head-on. Aries symbol is the charging Ram, who puts everything it's got into the fight or challenge of the moment. You're an Aries if you were born sometime between March 21st and April 21st. The admirable qualities of Aries are courage, physical vibrancy, a strong will, bold directness and lust for life. Aries' energy is most powerful when surging, and meeting a worthy goal. A skilled and talented Aries goes far since this is a very ambitious sign. Very often, what you see is what you get with Aries. And that makes them good leaders and the friend that tells you the truth, not only what you want to hear. The Aries lover makes you feel like you yourself are the Source when they shine on you. The irksome traits of Aries are being pushy, lacking any subtlety, willful, arrogant and often spoiling for a fight. The Ram can use people without meaning to and be on to the next big thing without a second glance. The Aries dark side is that the tendency to rage against everything, and ruthlessly crush competitors. Over time, Aries picks up the nuances, and with that wisdom, is able to be an even more powerful character. Element is Fire (inspired and instinctual). Body Association: Face, eyes, and head (skull, head arteries). Colors are the red shades, scarlet, fire-engine, ruby. Birthstone is diamond, created from intense heat and pressure. Gemstones (red) are bloodstone, garnet, ruby, red topaz, red aventurine, red agate, fire opal, orange celestite, ocher, iron pyrite. Flowers are tiger lily, forsynthia, gentian, honeysuckle, red poppy, geraniums, hollyhocks, anemone, red clover, crocus, narcissus, cuckoo flower, bachelor's buttons, stonecrop. Animals are the stinging insects (wasps, hornets), the swift ostrich, and prey animals like the fox, badger and shark. Aries is an actor on the stage of life, vivacious or virile, inventive, a dynamo leader-type, the first to rush in, self-motivated, ambitious, ardent in love. Aries comes on strong and overwhelms more timid types. The Ram comes alive with a lover that can stand his or her ground and is also animated by friction. The fight of Aries is a thrill, and what drives this passionate character. But to those that crave peace and compromise, it's a total drain and not fun. The Ram is loyal in a match that's always made new. They're not wanting to analyze or dissect patterns of relating. The instinctual fire of Aries gets to the heart of the matter quickly but doesn't want to linger long in states of reflecting on love. Aries is an action sign, and they seek friends who will join them at that edge. Read more about Aries with other Zodiac signs in love. At the extreme edges, Aries is selfish, ruthless, easily bored, intimidating, harsh in behavior and speech, blinded by ego, careless, unaware of nuances, trampling of sensitivities. A restless Aries is tough to be around, as they're seeking intensity and could provoke everyone around them to create that atmosphere. When Aries gets depression, very often it comes through as big anger. Aries thrives on intense challenges, competition, new adventures, hatching grand schemes, sparking a wildfire of enthusiasm, lighting up a room. Aries is brave-hearted, generous, demanding of Self and others, passionate and driven. *The Dates for Aries change every year, so check an ephemeris if you're on the cusp. Aries is the fiery first sign of the Zodiac, coinciding with Spring (Vernal) Equinox that falls around March 20th.